After speaking with Jody - manager of special collections at the Seattle Public Library - she suggested that I look at the historic photos of Seattle's Denny regrade project. Basically, all the hills in Seattle were getting in the way of expansion, so they tore those suckers down! The massive destruction and molding of earth is what strikes me most. Therefore, for my library/ art project I will focus on the concept of massive cutting for the hope of some imagined civilized future. I am thinking of making a series of wood block prints, or possibly layered paper cut-outs - something using the process of cutting in any case. 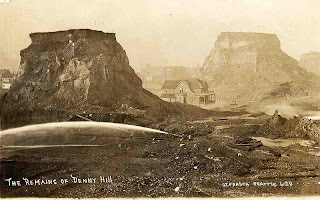 This leveling -- called the Denny Regrade -- proceeded in two stages: 1902-1910 and 1929-1930. 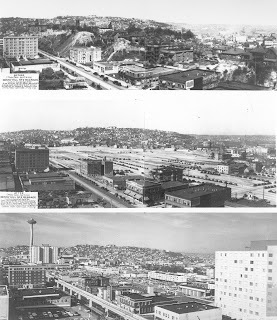 Photographs of Denny Hill from 1928, 1936, and 1964. New features from ‘64 include a Space Needle and enhanced photo stitching technology sans seams. Photograph courtesy Seattle Municipal Archives. Nas hands modeling the special gloves we get to wear whilst perusing special collections.